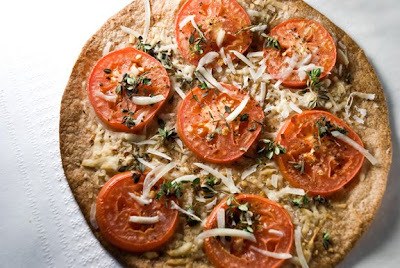 Here are a few of my favorite recipes for fun little tortilla-crust pizzas that couldn’t be quicker or simpler to make. Because of their super thin crusts, they’re not only crisp and delicious, but they have a fraction of the calories of traditional pizzas. The best part is, they come together in a flash. I made all three of these recipes for dinner and cleaned up, all in less than an hour. Quite a feat for me since I tend to be a bit of a snail in the kitchen (I like to “dilly dally” as my Mom would say). 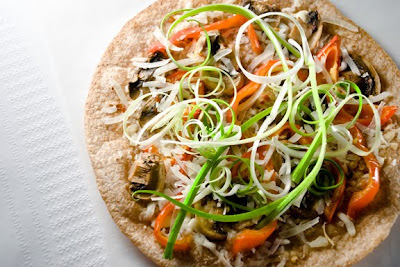 I hope these recipes will inspire you to come up with your own tortilla pizza creations. 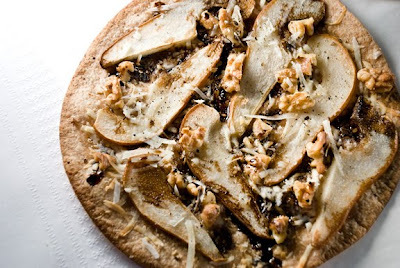 The one rule when making these pizzas is to not put too many toppings on or you’ll end up with a soggy mess. It’s for this reason that you’ll notice none of my recipes use a sauce. Even a light tomato sauce will keep the tortillas from getting crisp, resulting in disappointing pizzas. I hope you enjoy them as much as I do and be sure to send me your own creations. Arrange the tortillas on a baking sheet. Rub each tortilla with the cut side of the garlic. Sprinkle each one with a few tablespoons of cheese (reserve a couple teaspoons for later). Top with a layer of the sliced tomatoes. Sprinkle with a bit of salt, pepper, and a pinch of red pepper flakes (if using). Bake for 5 minutes until the tortillas just begin to brown around the edges. Remove from the oven and top with the remaining cheese and thyme leaves. Arrange the tortillas on a baking sheet. Sprinkle each one with a few tablespoons of cheese (reserve a couple teaspoons for later). Top with a layer of the pepper/mushroom mixture avoiding any juices that have accumulated at the bottom of the pan. If using, sprinkle with a small pinch of red flakes. Bake for 5 minutes until the tortillas just begin to brown around the edges. Remove from the oven and top with the remaining cheese and green onions. In a glass measuring cup, microwave the balsamic vinegar for 1-1/2 minutes. Continue to heat and stir every 30 seconds until the vinegar has reduced to just over a tablespoon. 2-1/2 minutes is the perfect amount of time for my microwave, but microwaves vary. Too long and the vinegar will burn and you’ll have to start all over. The finished product should be a syrup that will thicken as it cools. Set aside. Arrange the tortillas on a baking sheet. Sprinkle each one with a few tablespoons of cheese (reserve a couple teaspoons for later). Top with a layer of the sliced pears. Scatter walnuts over the pears and sprinkle with pepper and a bit of salt. Bake for 5 minutes until the tortillas just begin to brown around the edges. Remove from the oven and top with the remaining cheese. Drizzle with the balsamic syrup right before serving. Hi Melissa! These look so tasty :) I love reading your blog! Where do you normally buy your food? Do you buy organic fruits/veggies? I'm not in the U.S. right now..but I would love to know for when I get back! Can't wait to make these. They looked delicious when you brought them into work!